In several states across the country, lawmakers are gearing up to debate whether pseudoephedrine (PSE), an ingredient in cold medications like Sudafed, should require a prescription. While PSE has long been an ingredient that consumers have relied on to treat nasal congestion, it is also one of the main ingredients used to make methamphetamine (meth). According to data from the Substance Abuse and Mental Health Administration, over 100,000 more people used meth in 2013 than in the previous year. Meth is a highly addictive illegal drug that can be produced relatively easily by combining household chemical ingredients with these common over-the-counter cold medicines. The impact of meth use and production extends far beyond those who use and abuse the drug, spurring unintended “collateral damage” for the surrounding communities including fires caused by lab explosions, the cost of foster care for children whose parents are drug users and toxic waste from the chemicals used to make the dangerous drug. Advocates of the prescription-only legislation believe that it will be more difficult for meth producers to get their hands on PSE products, which would in-turn decrease meth-related crime and lab incidents. However, others argue that requiring a prescription for these cold medications would punish innocent cold and allergy sufferers, who would sacrifice extra time and money for doctors’ visits to acquire the prescription. There is a trend developing locally that is impacting meth production in a positive way, all without enacting sweeping law changes. Many pharmacies across the country are taking the issue into their own hands by making a change in the type of PSE products they sell. 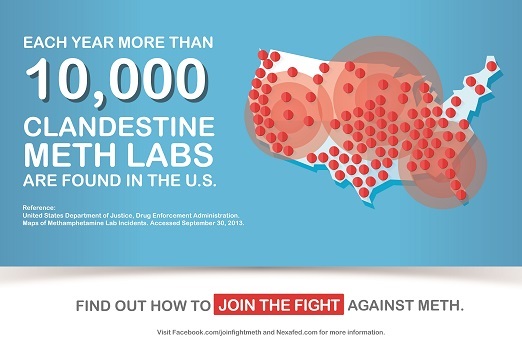 Their relatively simple switch to “meth-resistant” pseudoephedrine products has started to drive down illegitimate PSE sales and reduce meth labs in areas of the country. Over the past two years, nearly 30,000 pharmacies nationwide have started stocking this new type of pseudoephedrine, which includes technology that makes it harder to convert the cold medicine into meth. Pharmacies in West Virginia – including CVS, Rite Aid and the local Fruth Pharmacy chain – have taken it one step further and have done away entirely with traditional single-ingredient PSE products and replaced them with “meth-resistant” formulations. According to local reports, the state has seen a 30 percent drop in PSE sales since the pharmacies stopped carrying Sudafed and its store-brand generic equivalents. In nearby Tennessee, two counties in a particularly meth-ridden area implemented a similar program and saw a 75 percent drop in PSE sales and more than an 85 percent decrease in meth labs. Nexafed® has been clinically proven by FDA standards to treat nasal congestion as effectively as standard PSE, while also reducing the amount of pseudoephedrine that can be converted during the meth-making process. Impede®, the unique meth-resistant technology in Nexafed, works by trapping the PSE in a thick gel that forms when the medicine tablet is placed in water or other solvents, which is generally how manufacturers extract PSE from cold medications like Sudafed. The product’s unique meth-deterring technology renders it essentially useless for meth producers who get a significantly lower yield of meth from the product to make it worth their time. While these cold-medications won’t solve the broader meth addiction and abuse problem, data show they are making a difference in reducing illegitimate PSE sales and domestic meth production. This means fewer fires, less toxic waste, lower costs for cleanup and foster care – all desirable outcomes without requiring legislation. For pharmacies, stocking meth-resistant cold medications is a simple way to provide customers with the medicine they have always relied on without requiring them to visit the doctor every time they have a cold. And this switch keeps meth producers looking elsewhere. Acura Pharmaceuticals provides an unrestricted educational grant to The Meth Project, a large-scale prevention program aimed at reducing meth use through public service messaging, public policy, and community outreach. Visit www.methproject.org for more information and find out how to help Join the Fight Against Meth on Facebook. Methamphetamine seizures by law enforcement are on the rise, according to the Drug Enforcement Administration. The rate of methamphetamine overdose deaths is rising, but there are no drugs approved by the Food and Drug Administration to treat meth addiction, Kaiser Health News reports. A new study finds meth use among pregnant women is on the rise. Hospitalizations due to methamphetamine use have risen sharply in the United States, NBC News reports. It is just a way for Big Pharma to get rid of useful drugs that work and are cheep and are non-prescription. That way they can sell the new super expensive drugs with death causing side-effects. I am not a pharmacist, but, I do work with several pharmacists, and I am also someone who suffers severe allergy problems. I applaud WV for taking some degree of action against the Meth epidemic, but I am afraid pharmacies refusing to stock drugs that actually work, and blindly jumping on the Nexafed wagon, isn’t the answer. The pharmacists in my company who have actually tried it say it’s useless. Having tried it myself, I totally agree. The only people advocating for it are the pharmacists who have never tried it (because they just go by whatever the manufacturer’s literature says), and the pharmacy CEO’s *cough* who want praise and media attention. Unfortunately, the stuff is totally useless for most people. And worse still, the out-of-control meddling by the government in the medical/pharmacy business, has made doctors fearful of prescribing Sudafed to people who actually need it. I see it everyday in my work, and it’s nothing more than a lazy strategy of throwing the baby out with the bathwater. Interesting article. I am a recovering addict of 28 years +. My drug of choice was not Meth. However, back in the days of buying cough syrup with codeine one had to sign for it. Why not have people sign for this medication. They wouldn’t be able to buy quanity and surely it would be documented the abuse by some of these addicts. Know matter how hard one tries to make situations different, there is always another way. Addicts are amazing people and will do anything to get what they want, when they are in active addiction. Thank you for allowing me to comment…. Thank you to all the pharmacies that are helping to eliminate meth labs in their communities!